← Generation Five: Who Ya Gonna Call? Last time, it was decided that Pollux was the heir due to meeting the criteria (aside from the whole ‘ghost baby’ thing!) I’m still working hard on finishing all the ingredients for the ambrosia. All I need now is the Life Plant. I’m hoping one of those plants that Bao is so lovingly caring for is a Life Plant. Pollux plays in the sprinklers, not knowing how much rides on those few plants! 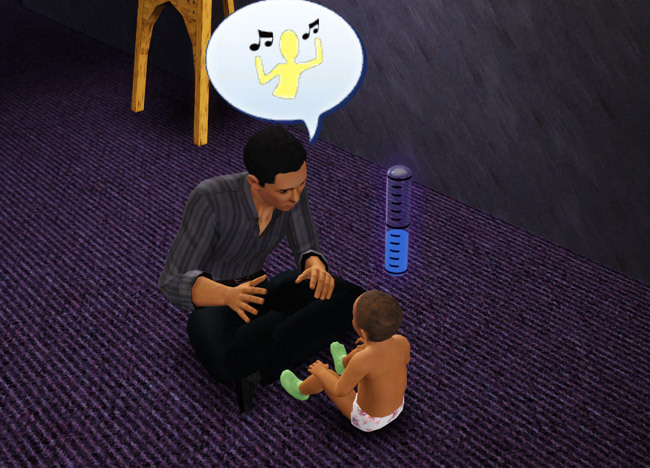 When Bao isn’t being forced to care for plants or paint, he spends time teaching Deneb his toddler skills. Why? Well, because he keeps rolling the wishes and I only ignore the toddlers if the parents decided to. Bao is pretty determined that Deneb is going to grow up normal, despite the fact that he’s Insane. Good luck with that, Bao. HOORAY! It’s a Life Plant! I just had to take a picture… man! I was so worried, it took so long to pop up and I figured it was just another stupid Death Bush or whatever. YES! The ghostly duo tackle the humdrum task of homework while granny Noémi talks trash, literally. But when I hover over it, it says it’s perfect! After trying to distract the boys from furthering their education, Noémi heads out into the hallway to have a go at Bao. Seriously, Noémi? Sheesh! Oooh, low blow… poor Bao. Phoebe finally reaches her LTW. She just turned Adult, so it’s definitely time to kick her out of the house. Also, what’s up with that outfit? That’s kind of ridiculous. It doesn’t really scream ‘Superstar’ to me. Yeah, but why are you wearing them at night? This isn’t an eighties song, you know. I have Aludra cook up some ambrosia once she’s finally able. The life of a wanna-be Crime Boss is a busy one. I’ve never had ambrosia in my game before, but it’s not terribly impressive. There’s a silly rainbow effect added to it. Yes, I know, so just store it in the fridge. It’ll be Pollux’s teenage transition present. Phoebe enjoys one last book from the huge Astrum library before she heads out into the big, bad world all on her own. Pollux seems completely unfazed by all of this. He’s pretty invested in those video games. Yeppyyyy….. he is a real boy, but am glad u keeping Sirius as a ghost as it just seems right for this generation. I gotta keep one around as a ghost. I was getting rather used to them being like that, to be honest… although the noise is driving me bananas still. I believe with criminals when you get promoted, you get the next day off. My heir just got promoted, and she’s finally working normal hours. (bank robber) only thing is, she got sunday off, then tues. and wed. :/ SO I was like “WORK damn you! We need more money!” Because she was the only one making decent income, and I just kicked out everybody, so it was just her and her husband. You know, I think I remember something like that! I was just so used to Awesomemod (which rids of that annoyance) and it’s been awhile since I’ve had someone in a career that does that, so wow. Booo! What a bummer. 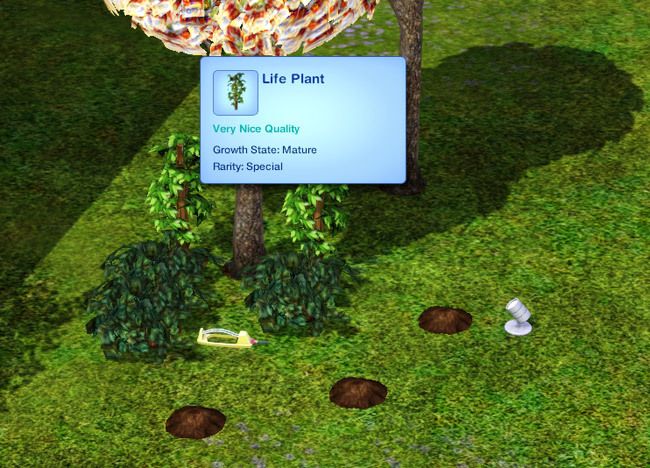 Yay, a life plant! I actually played TS3 all weekend because I had no time to blog but still wanted to play. And I still haven’t got any damn life fruit! I don’t even know why I want it. I just have to have one. I’ve seen that “Visit Sim’s Home” wish, for Sims already in the house. I’ve also seen “Move Sim In”. So silly. LOL, I love the purple fan! I’ve never seen that either. Ha, it kind of matches the house, at least. Once Sirius is out on his own, you could end up with a legion of ghost offspring walking around the hood! I was so happy when I hovered over and saw that. At first, I thought it was just another cruddy death plant. Hooray! Keep checking around the graveyard if you’re in SV. I think the sims have just gone daft. I get those both a lot! The fan cracked me up. I’ve seen it, but only rarely. Very funny for a guy to do. Oh man, dead army! Awesome! Yay! Opposites life stage for Pollux. Once dead and then alive, Lol. It can only happen in this game. Oh, that picture of Bao with fan is killing me, ROFL! I have seen weird wishes like visit someone home or move out with someone when in fact she/he is already there. Perhaps it’s a glitch/bug? Noemi seemed so ignorance with all that was going on in the house, mostly with Draco. Yay, he’s a real boy! 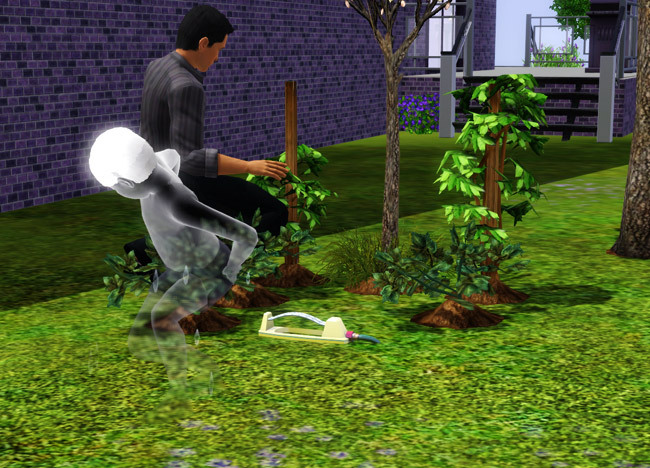 That’s pretty cool, I haven’t tried turning a ghost back into a living Sim yet, so it was nice to finally see the animation. I just (finally) got World Adventures last week and saw a Chinese tourist in the Sunset Valley gym doing the fan animation for the first time yesterday. It was a man, and yes, it does look really silly! I haven’t seen the Visit Sim in Home wish before, but I have seen my Sims wish to move in Sims that already live with them. Both Mortimer Goth and his wife wished for each other to move in, after they had already been living together for years and had two children. 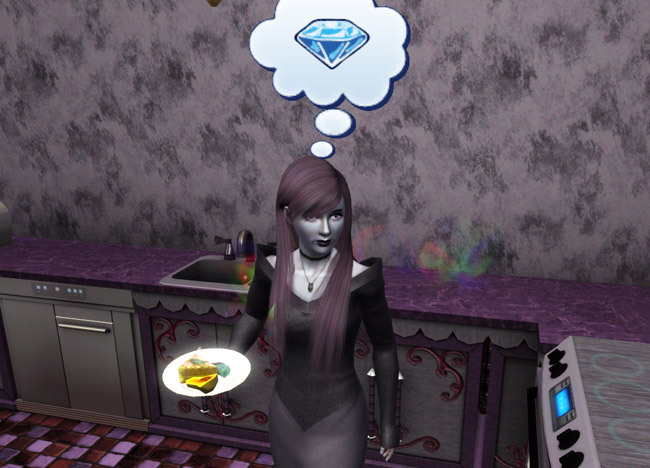 Apparently, the Sims 3 Sims are very forgetful! Hey there, Shana! The animation for the ambrosia is pretty amusing, especially the end part. I have a picture of that for the next update. The fan is too funny! Why didn’t they have the men do something more… manly? LOL! I think the sims are going senile. I haven’t had this issue until one of the WA patches, must be something with that. It amuses me, though. There’s also the wish for a kid to graduate that’s already a young adult or adult! Is it me, or does Pollux look a million times better as a real boy than a ghost? The face in ghostliness was so pudgy and puddingy. I can’t get over the concept of story progression in this game. The level of autonomy is a little bit scary! 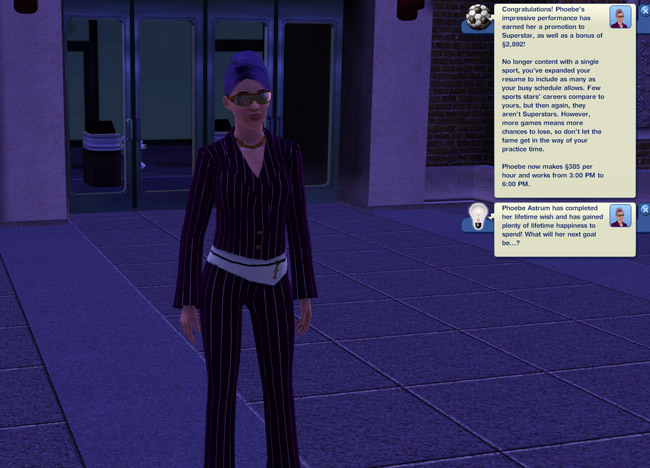 If even sims in your own active house can get jobs, who knows what the heck the rest of them are getting up to! I’d love to see a brief update on the spares someday, if you ever feel like it. He really does look ten times better as a “real boy(tm)” than a ghost. On the other hand, Sirius looks much better as a ghost! Funny how that works. I’m using a story progression mod, so it’s not base game. No worries. As for the spares, uuh… they are kind of hugely huge. In fact, so many that they are inter-marrying between generations. It’s kind of weird, LOL!